For the first time in weeks, we’ve seen some clear, positive upwards momentum for the coin-wide market. Cryptocurrency’s comprehensive market cap is up 23% at $326bln, up from $248bln last Friday morning. But there’s one caveat: most of this growth has come in the last 36hrs. Leading price movements as usual, Bitcoin rose roughly $1,000 dollars in a single hour, leaping from $6,800 to just over $7,700 between 7:00 and 8:00am on April 12th. 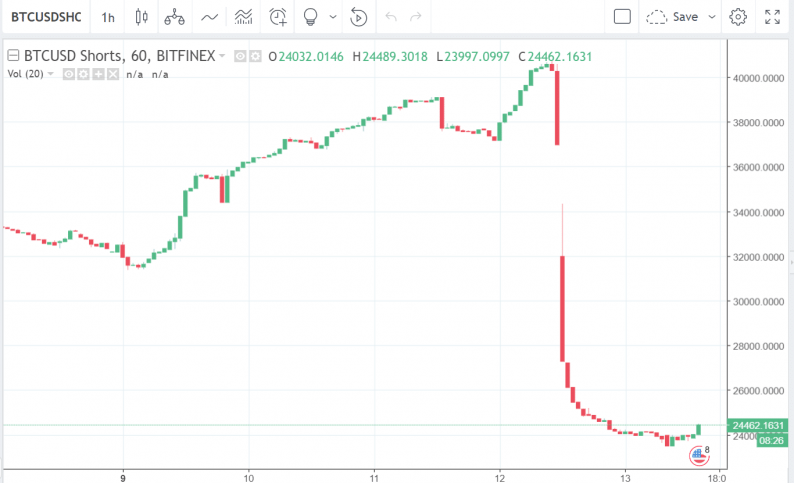 Coinciding with this dramatic price movement, Bitcoin shorts were squeezed to their lowest volume in half a month, as roundabout 15,000 trades closed their position over the course of Thursday morning. As shorts were cut short and prices blew through the roof, Bitcoin’s one hour trading volume during its spike was $1.2bln, potentially the largest one hour volume in the currency’s history. The upwards price movement is no doubt good–we’re all happy about seeing some green in the portfolio–but this short squeeze was so spontaneous and the price movement so like “recoveries” we’ve seen earlier in 2018’s bear market that we’re not drinking the bullish Kool-Aid yet. Still, shorts were at an all-time high before price action shifted and some ~37% were liquidated, and the massive trading volume on Bitcoin’s one hour rise is encouraging. Positive developments, but stay savvy as we may not be cleared for takeoff yet. Bitcoin: As we went over above, Bitcoin underwent a drastic price increase yesterday morning. As of press time, it’s weekly price up 18% at $8,050. Ethereum: After performing poorly for a handful of weeks, Ethereum is looking even better than Bitcoin, up by 27% over the week with a price just over $510. Ripple: Ripple is on pace with Ethereum, sitting at $0.65 after rising 27% this week.